LastPass is easy, secure password and data management. Not only is the LastPass Password Manager free, it saves you time while keeping you safe. It is available as a plugin for Internet Explorer, Mozilla Firefox, Google Chrome, Opera, and Safari. It offers a premium subscription that includes iPhone, BlackBerry, Android, Windows Phone, Windows Mobile, WebOS and Symbian applications. Passwords in LastPass are protected by a master password and are encrypted locally and are synchronized to any other browser. LastPass also has a form filler that automates password entering and form filling. It also supports password generation, site sharing and site logging. Google Authenticator is for Google users enrolled in 2-step verification. The Authenticator provides a six digit number users must provide in addition to their username and password to log in to Google services. 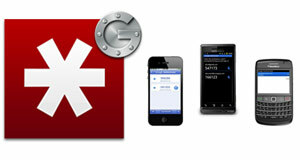 LastPass now supports Google Authenticator as a multi-factor authentication option. The latest version of LastPass browser extension or mobile client. A supported mobile device to run Google Authenticator application. Install the Google Authenticator application on your mobile device. Google officially supports Android, iOS (iPhone, iPod Touch, or iPad), and BlackBerry devices. 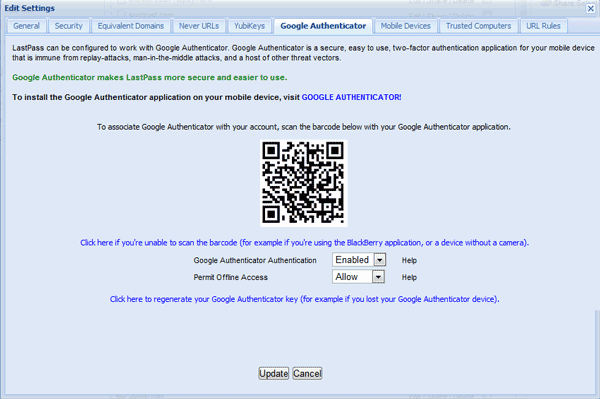 There is an article on Google: Installing Google Authenticator. Launch Google Authenticator on your mobile device. Go to https://lastpass.com/?ac=1&opengoogleauth=1, follow the instructions there to finish setting up Google Authenticator. You will be prompted to use a Bar Code scanning app (Androids, iPhones and supported devices with cameras) to scan your unique bar code, or you can manually enter the Google Authentication Key found on that setup page. How do I adjust my security settings to high level? Next article: How to fix the problems with Facebook on Google Chrome? I heard about LastPass on CNET. I don't use it though, I just let Chrome save my passwords for me which is encrypted with my Google password. Andrew, have you heard of Disqus comments? I suggest you look them up. They are a real nice comment system. I use it at my website. Disqus comments generates web traffic to a site, and is just a great discussion system.